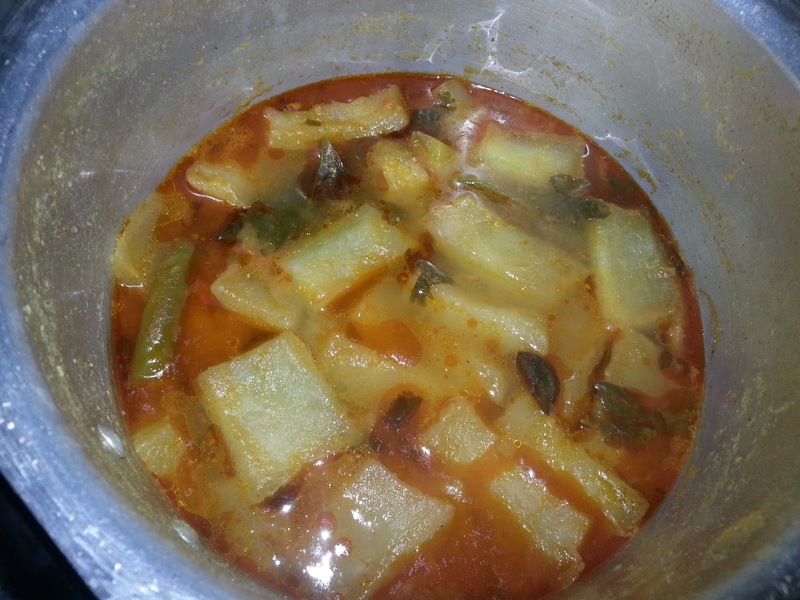 Kaddu or Bottle Gourd is a very tasty and healthy vegetable. This daal is cooked like a curry and is a great accompaniment for steamed rice. It tastes good with roti, dosa and idli too. This is my mother's recipe and one of my favorites since childhood. Other vegetables that can be used to prepare daal in place of Bottle Gourd are Brinjal, Drumstick, Raw Green Banana, Chayote, White Raddish. Daal made with combining brinjal, drumstick and raw green banana is my all time favorite. When Raw mango is in season it is used in place of tamarind and that makes this daal even more tasty..
1. Soak Tamarind in water and keep aside. I microwave it in a tall bowl with just enough water for 1 minute intervals thrice. 2. 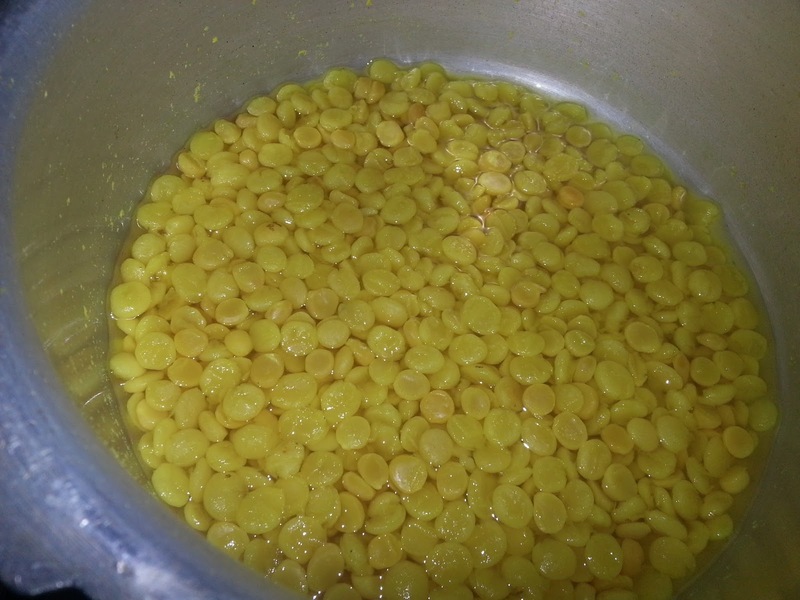 Wash both the daals and pressure cook with turmeric powder for 6-8 whistles on medium flame. 3. Let the pressure release on its own, mash the daal once it cools down. Keep it aside. 4. 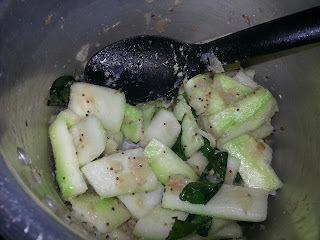 Peel the bottle gourd, cut it and remove all the seeds and mushy fibre and discard them. Cut into bite sized pieces and wash them. Keep it aside. 5. In a pressure cooker heat oil. 6. Add mustard seeds and once they splutter add onions, green chillies and curry leaves. 7. Fry till onion turns translucent. 8. Add the bottle gourd and mix well. 9. Fry for a minute and then add ginger garlic paste. 10. Fry for another minute then add chilli powder, coriander powder and salt and mix well. 11. Add tomatoes and let them cook for 2 minutes. 12. Add the mashed daal and let it cook for another 2 minutes. 13. Extract juice from the tamarind and add it to the daal and mix well. 14. Add some water and let it come to a boil. 15. Add coriander leaves. Pressure cook for 2-3 whistles. 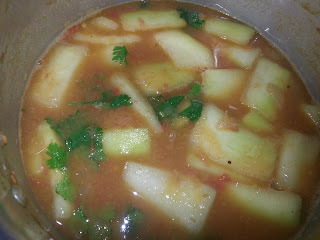 Do not pressure cook for longer as the bottle gourd will dissolve. 16. Let the pressure release on its own. 17. Adjust the daal consistency by adding water as required.